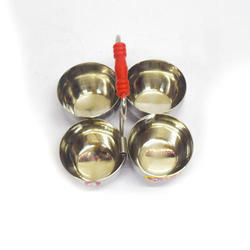 We offer a wide range of Aluminum Bowls to our esteemed clients. Offered in different sizes and designs, these bowls are widely appreciated for its quality finish and long lasting impression. We customized our products as per the client’s need. In order to cater the numerous necessities of the patrons, we have been able to provide a wide range of Steel Salad Server. It is made up of buffalo horn and fully made by hand. We are the importer of different types of toothpicks like bamboo toothpicks and plastic toothpicks. We have big client approval by providing an appreciable range of Stainless Steel Spaghetti Server. These products are extremely praised in the market for its features like long-lasting design, lightweight and fine finish. These products are used in different hotels, canteens, and home. We offer wide range of Serving Utensils. Each item is offered with smooth surface and is carefully weighted to assure perfect balance while holding. We have wide range of designs, styles with options of thickness as per requirements. We can make any big quantity of order in very short time.